I've had the pleasure of testing out a few CEP compression products. You can find my review of their compression socks HERE. 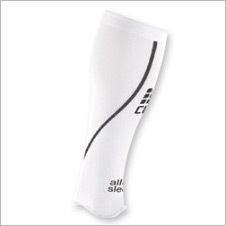 Along with the socks, I've also been using their All Sport Compression Leg Sleeves. These are similar to the socks, except they only reach your ankles, offering you the opportunity to wear your own preferred brand of socks. According to CEP: Compression advantages: performance-enhancing compression for improved oxygen supply to the calf muscles, faster resorption of lactic acid, better performance and accelerated regeneration. The support fit stabilizes and minimizes muscle vibrations. According to Tricia: I've ran in these and worn them for recovery after long runs. They took awhile to get used to on the runs. My calf muscles felt a little tighter than usual at the start of the runs, but they did still feel fresh at the end of the run. I liked the option of being able to wear my regular running socks. I prefer to wear them for recovery though. The compression SOCKS are my favorite, but these offer a nice option for when you want to wear sandals the next day or simply want something a little less intense. Here is how to win a pair of your own. The giveaway runs until 11:59PM 10/24.You can enter as few or as many ways as you would like. Please leave a separate comment for EACH entry. 1. Go to CEPcompression.com and shop around. Come back and leave a comment telling me which product interests you the most.